I love when a brand new restaurant opens up and there’s a bit of a buzz about it! 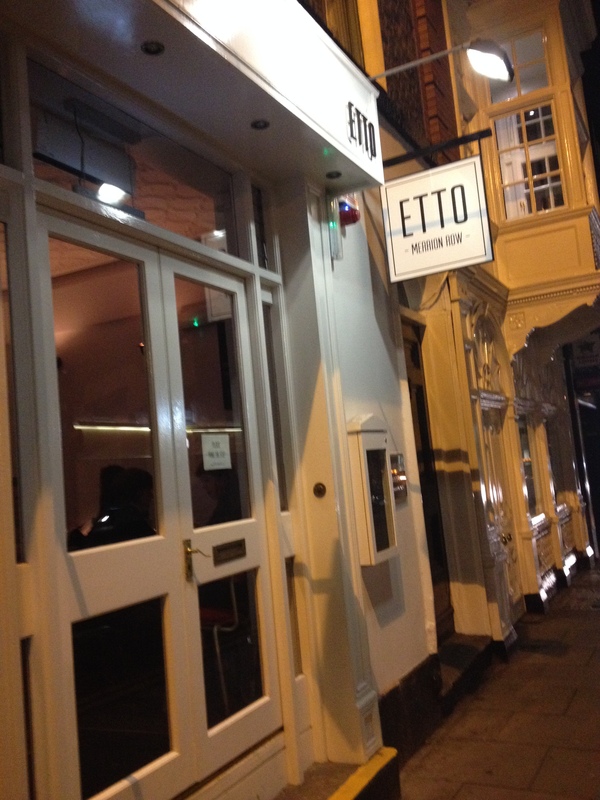 In the past 6 weeks there’s been a few new additions to Dublin’s food scene and one that I’d heard 100% great reviews about was Etto on Merrion Row. It opened mid October and between one thing and another I didn’t get a chance to visit until this week – and I’m super glad I did! Apologies in advance for the pics… it’s dark, I use an I phone camera and the flash was doing me no favours that night! 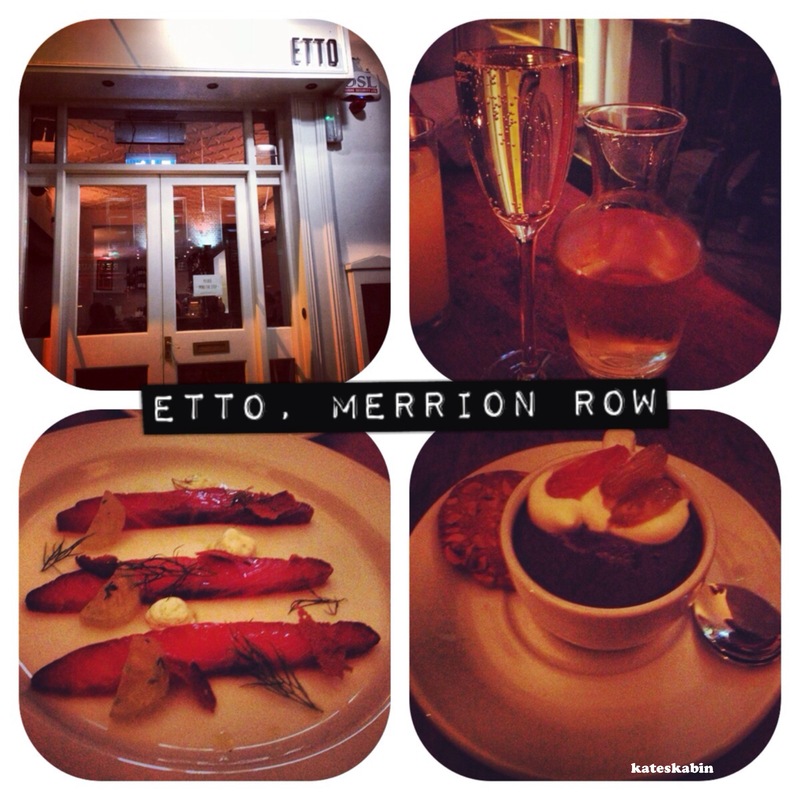 After a lovely Tuesday afternoon strolling around the shops in town I made my way to Merrion Row, absolutely dying to try this place out. I almost walked past as it’s a pretty small spot but the little white sign caught my eye and in we went. To say the place was busy is an understatement – it was jam packed! We were a few minutes early for our table so took a seat at the bar at the back of the restaurant and had a look around. The décor is plain and simple with plain white walls and minimalist decoration. 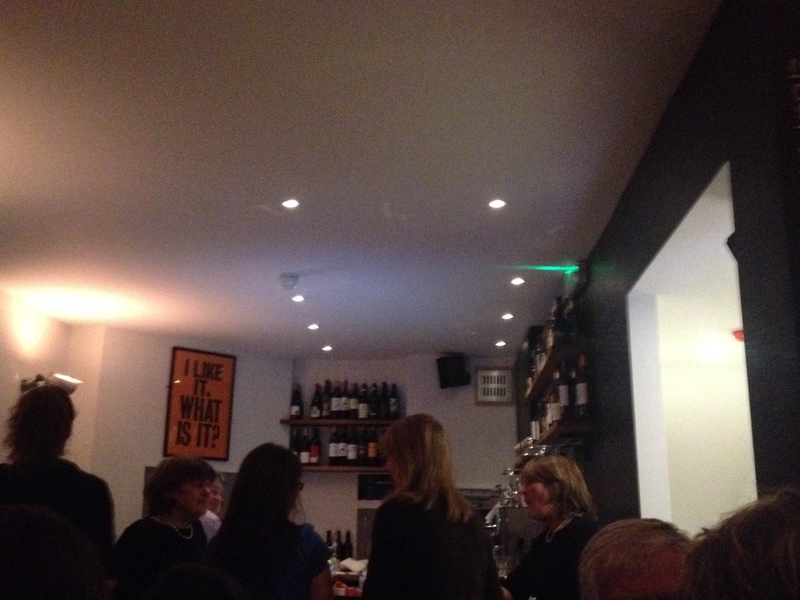 It doesn’t have the feel of your typical restaurant, more of a semi casual restaurant come wine bar. I couldn’t believe how busy it was on a cold Tuesday night but considering the rave review in the Irish Times the week before I guess it’s no surprise! After being seated I firstly ordered a drink. 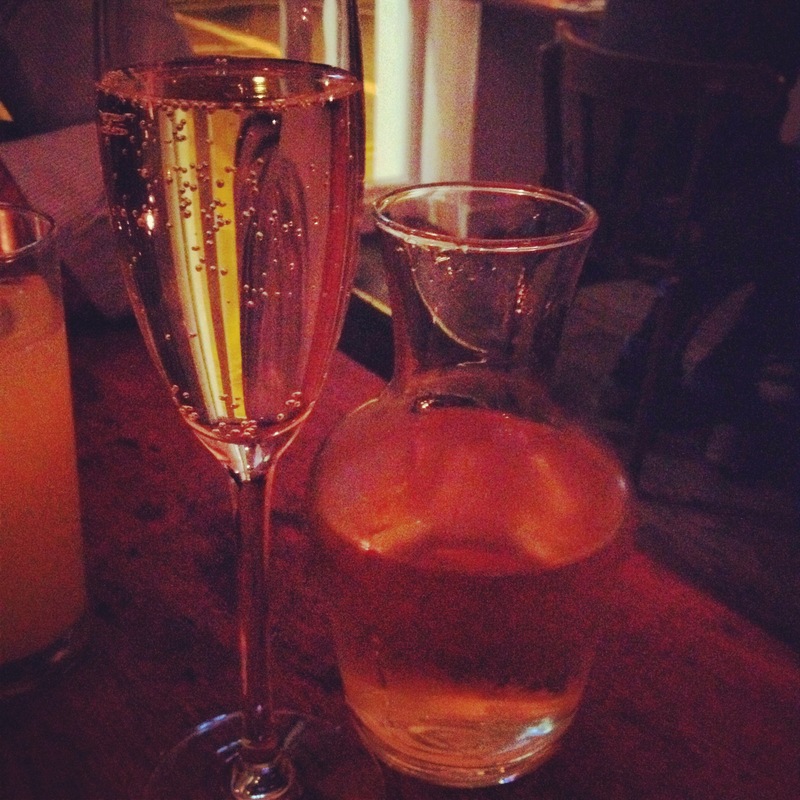 The fact that they have Prosecco on tap is good news to me. I always want more than one glass but not the full bottle so I went for the carafe which was priced at €23 and a soft drink. We had a look over the menu. The guys at Etto change up the menu every few days to make use of fresh produce so I wasn’t sure what would be on the agenda for the evening. They offer a section of nibbles priced from €2.50 to about €6, a section dedicated to charcuterie plates price around €7 each or €14 for the selection and a small plates, large plates, sides and desserts section with smalls about €10, large plates €15- €19 and desserts about €7. There was a fair bit of choice on the menu so I decided to get a few smaller bits rather than a large plate. 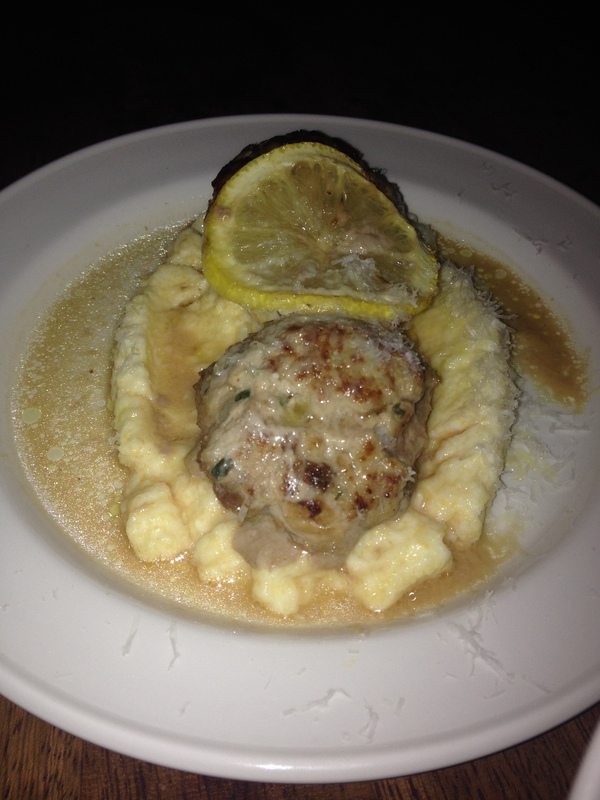 We shared the Veal and Pork Meatballs first off, €9. They arrived on a bed of soft polenta with a slice of lemon on top. I have never been a big fan of polenta if I’m honest but am really trying to vary what I go for in restaurants instead of always going for the same stuff. I can’t remember what I last ate it with but this occasion was way better… it was tasty and smooth. This dish was a welcome change from the typical meatballs in tomato sauce which I do love but is pretty standard as a starter in so many restaurants. The meatballs were really soft with the meat cooked for not a second too long and a few juicy raisins thrown in – sounds like an odd combo but it worked! 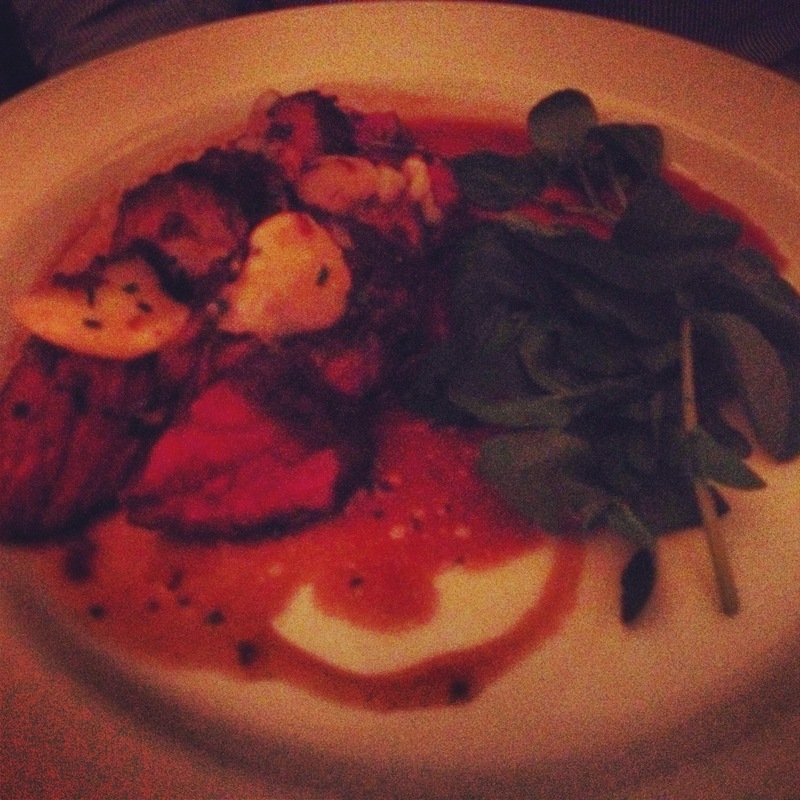 For mains E got the Grilled Onglet. Having never heard of onglet before we had to ask what it was – a cut of steak for anyone else who is as in the dark as me! It can also be called hanger steak or skirt which I am more familiar with. As is the norm he wanted it well done, but was told this cut is better served medium…. So medium it was! Priced at €19 it came with 3 small dripping potatoes. The portion size of the sides with it was on the smaller side that what you would be used to but priced at €19 it was very fair and reasonably priced. I really wanted some nibbly food. I enquired if they did a board with a mix of charcuterie and cheese but unfortunately it was just charcuterie. So instead I opted for a good mix of the other bits and bobs. 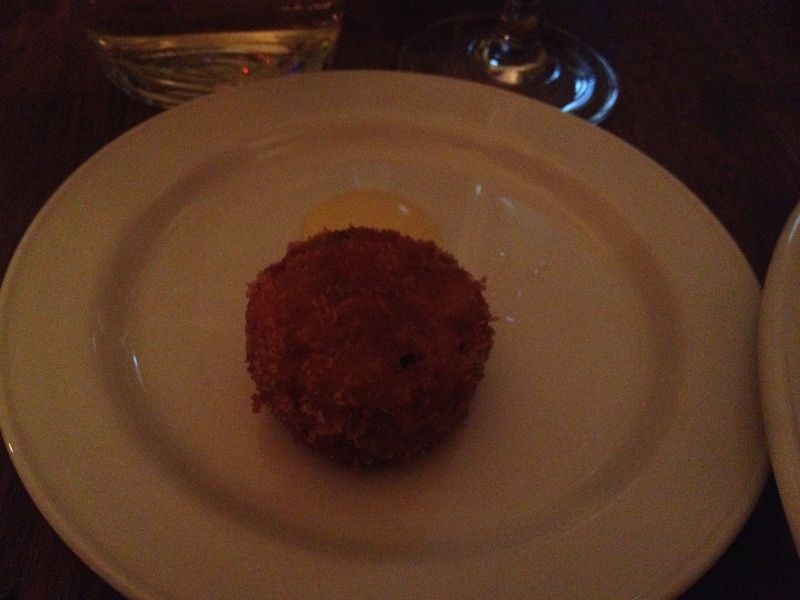 I tried the Sausicon sec, €5, the Cured & Smoked Salmon €10 and one of the Pork Belly & Smoked Eel croquettes, €3.50. I was most nervous about trying the croquettes to be honest, the thought of eating eel isn’t one I relished – but that was actually my favourite of the lot! Lovely crisp coating with extremely soft pork belly inside and the eel wasn’t an overpowering element in the dish at all, just a slight smokiness. They were so tasty and easy to eat, I could easily have devoured a few more! I was told the salmon is cured in treacle and is something special and our waitress wasn’t lying. 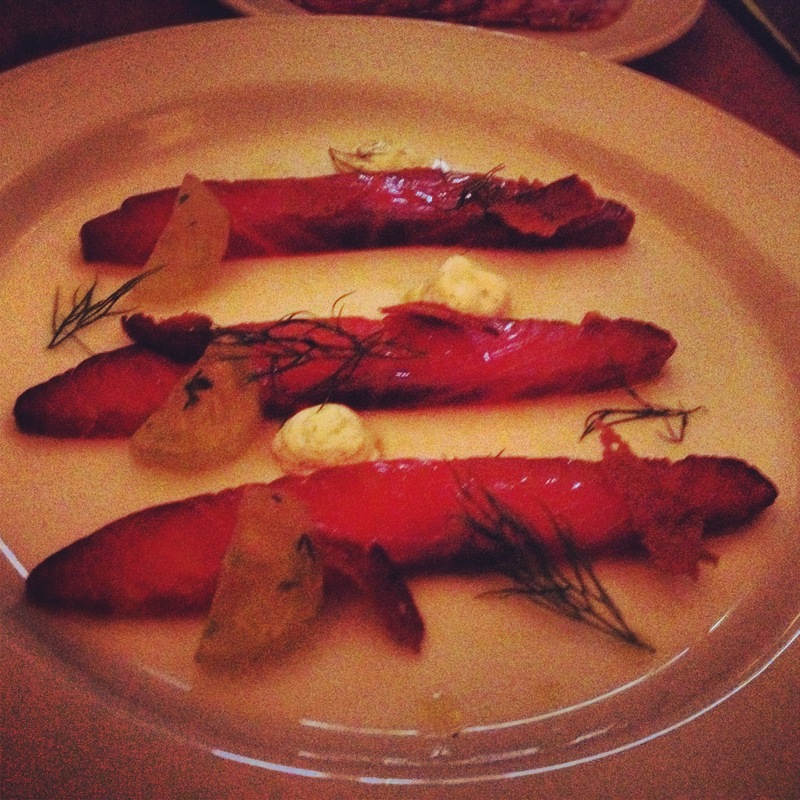 I adore smoked salmon and this one was fabulous, with the pickled cucumber adding to it. Lastly was the sausicon sec. While it was lovely it was my least favourite of what I’d chosen. 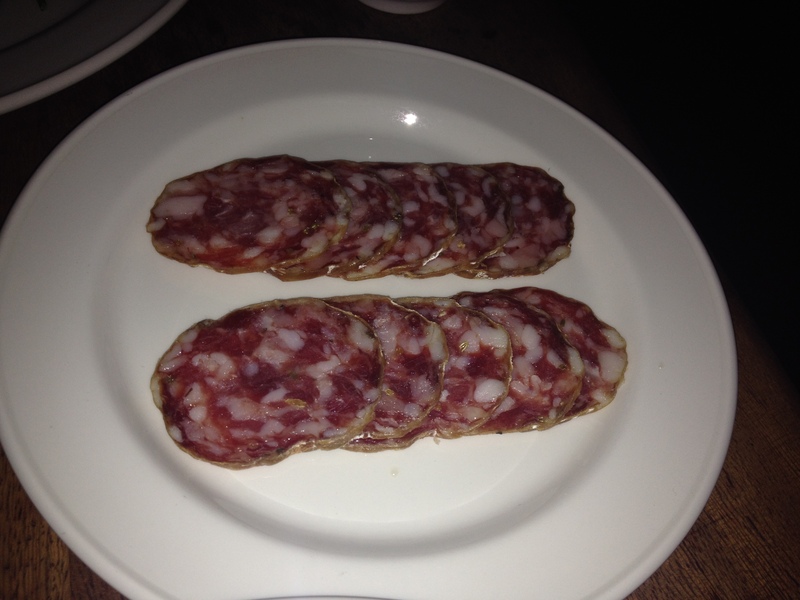 I do prefer to eat these meats with the mix of cheese and crackers – but that’s just a preference I have. I felt the meat a little too bland to eat a plate of it on it’s own, had it been a tastier or saltier meat I may have finished it off. The bitter chocolate pot was screaming out to be ordered so we decided to share it. 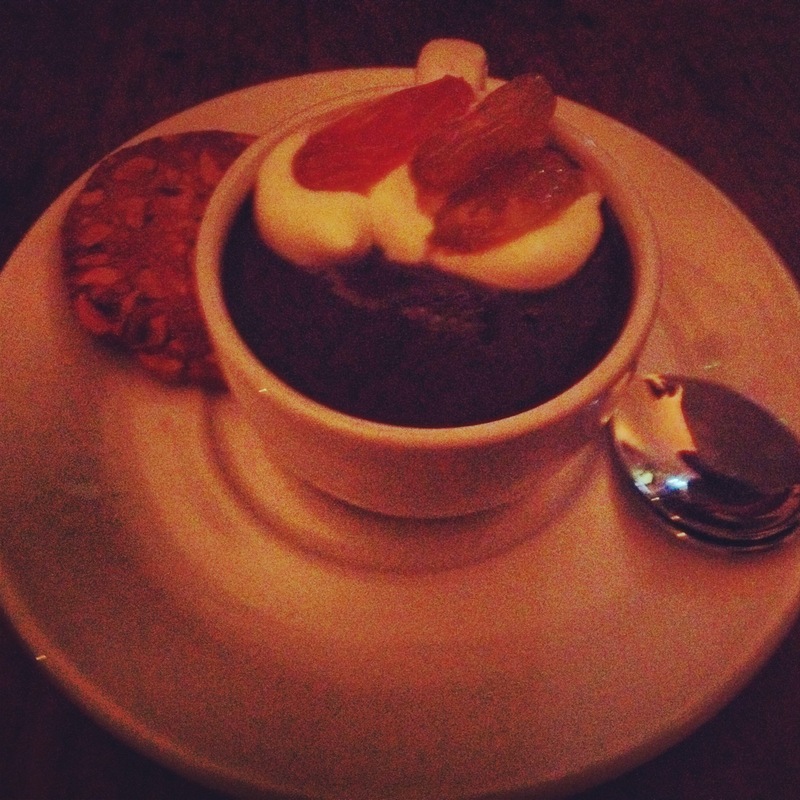 It came in a small espresso cup and was topped with a blob of cream or mascarpone and a hazelnut biscuit was served alongside it. I pretty much died and went to heaven eating this!! No chocolate is ever too much for me – ever! But I’m glad we shared this as it was super rich… not a complaint in any shape or form – I loved it!